Big enough to hold up to 25 bin bags of waste but small enough to sit on your drive, our mini skips are the ideal waste solution for small domestic clearance jobs. Our mini skips are all 2.5 yard skips – compact yet surprisingly roomy. A 2.5 yard skip is small and light enough to be kept on a driveway. It’s ideal for garden waste and light renovation waste, able to hold the equivalent of 25 bin bags. A 2.5 yard mini skip from Aasvogel measures in at 4ft (1.2m) long, 3 feet (0.91m) wide and 2.6 feet (0.76 m) tall. A mini skip is the smallest available version of a standard builders skip, with a modified shape to account for the shorter height. Our mini skips pack a surprising volume, perfect for mixed light waste. 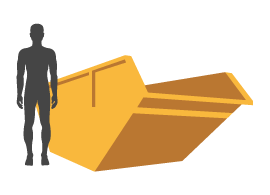 The 2.5 yard (3 cubic metre) capacity of a mini skip comes in a compact footprint – measuring just 4 feet (1.2 metres) long and 3 feet (0.91 metres) wide. When Would You Need to Hire a Mini Skip? Mini skip hire is perfect for smaller jobs that need a tough but lightweight means of waste disposal, like autumn garden clearouts or even a small bathroom refit. Mini skips can be used for light commercial jobs where only a small volume of waste needs to be managed at a time. 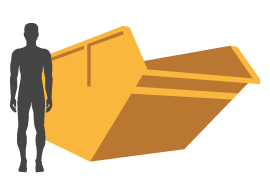 Because of their reduced footprint, mini skips can be kept on a driveway or in areas with limited access – which means you can save money and time on getting skip permits. Do I Need a Permit to Hire a Mini Skip? You won’t require a permit if you’re able to place the mini skip on your own land. Mini skips will normally fit quite easily on a front drive or garden, but it’s worth keeping in mind that we’ll require delivery and collection access. If you wish to keep the mini skip on publicly owned land, (parked in the road, for example), you’ll need to request a permit. Why Choose Aasvogel for Mini Skip Hire? Aasvogel has over 20 years of waste management experience. In that time, we’ve learned everything there is to know about recycling, repurposing and safe waste disposal. Above all, we’ve learned how to deliver excellent customer service. We want to make the process of hiring a mini skip as simple as possible. Our friendly, knowledgeable team handles any admin on your behalf, so you’re free to get on with the job. We pride ourselves on our unmatched customer service – but we don’t stop there. We’re committed to looking after our team, our customers and the environment. We’re conscious of the impact that industry can have on the environment around us, so we take our approach to ecology a step further. Our recycling rate is at 94% – and we’re always striving to go above and beyond, to make the world a cleaner, safer and more prosperous place. We’re also competitively priced – so you’ll get all of our experience and service at an agreeable cost. Want to know more, or get a quote for mini skip hire? Call us on 01235 760555 or use our online quote form at the top of this page. Skip sizes offered by Aasvogel vary, and we’re keen to give you the best value. So to make sure that a mini skip is right for you, our team of waste management specialists is always available to offer help and advice. Just give us a call on 01235 760555 for an easy way to hire a skip.